The Bee Family: Christmas Countdown: Day 19! Today's activities are ones I had been planning since the start of the holiday season. But, we don't own a book copy of How The Grinch Stole Christmas. So, I placed a hold for a library copy and waited...and waited...and waited. When I checked my status online I was the 4th or 5th hold on the book and it wasn't due back until after Christmas. Doing this after Christmas obviously doesn't fit in with the whole Christmas countdown craft thing; so, I asked my Mom if she had a copy we could borrow and crossed my fingers. Luckily, she came through! Surprisingly, there weren't many Grinch-themed crafts on Pinterest that I could find and even fewer that were age appropriate for my little ones. So, I had to do a bit of thinking. Of course, we started out by reading the story. White cake dyed green, topped with dyed green frosting and crushed mint candies. While we let those settle in our tummies we worked on some Grinchy crafts. This idea came to me last night when I was thinking over ideas I could do today. It's much the same as the handprint Santa we make, only this is a handprint Grinchy Claus! He's smiling because his heart already grew! To make it, just paint the palm of your child's hand green and their fingers white (you may also want to make the space just above the fingers white so the beard is connected together). Press onto paper and then add yellow eyes, a Grinch smile and nose, and a Santa hat. This next craft is based on an idea I saw on Pinterest. In that craft, children listed things they would do to make the Grinch smile. But, since I'm working with a pretty young audience, I decided to go a different route. On this side, I listed all the things my toddler told me made him happy. It was adorable to listen to all the things that make his little self a happy boy. Some items include: His mom, dad, and sister; cake! ; food! ; books; the library; the Christmas tree; cars...and more and more. On the other side, our Grinch was very Grinchy. On this side, I wrote down all the things my toddler said made him sad/angry. Some of which include: when you don't share; people taking toys; no treats; time outs; monsters; and scary noises. It was so interesting to hear his unprompted answers and it's a good exercise to get kids talking about/understanding feelings. Oh, the mind of a toddler. After that, we sat down to watch How the Grinch Stole Christmas. Toddler Bee will only watch the animated version and shuns the version with Jim Carrey. Which is fine by me because the cartoon version is a mere 20-ish minutes long. There were other crafts on the agenda but by the time we got done the above activities interspersed with the usual daily happenings it was getting on in the day and the kids were getting ready to wind down. But, I still have a few plans and if I am able to fit them in tonight I will post a Part 2 tomorrow. 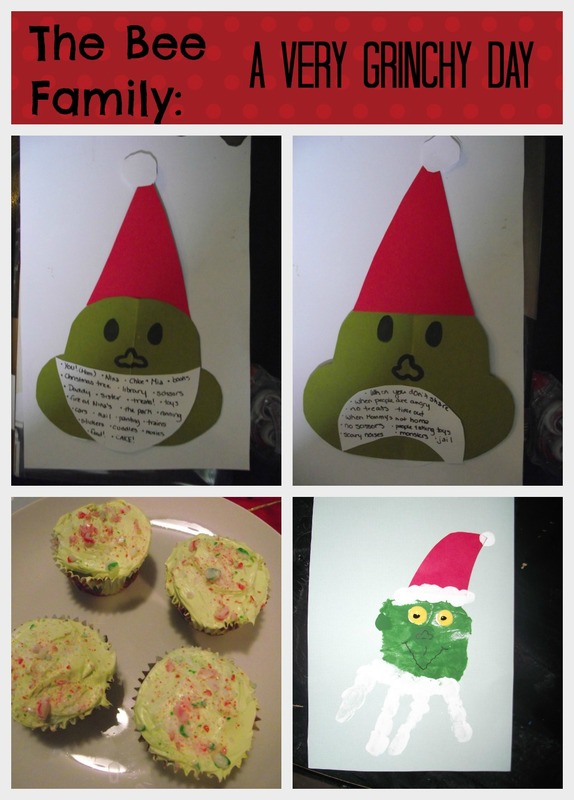 But, for now, I think our first Grinchy Day was a success! Not at all related to our Grinch Day (unless you call it a Holly Who Wreath!!) but it's lovely and I am so happy with the way it turned out!